The living room is where we spend most of our time. I know you’re not supposed to be a couch potato but I don’t care. When we have down time, we plant ourselves on the couch and get our TV fill. We love having movie nights with our girls and we frequently blast 90s music for impromptu family dance parties :-). Our living room is often packed with friends watching football games and fights or just shooting the poop 😉 Our living room is where it all goes down. And I love it! It has, however, been a struggle for me in the design department. It took me a while to even figure out which direction I wanted to go. Here’s what it looked like when we saw it for the first time. 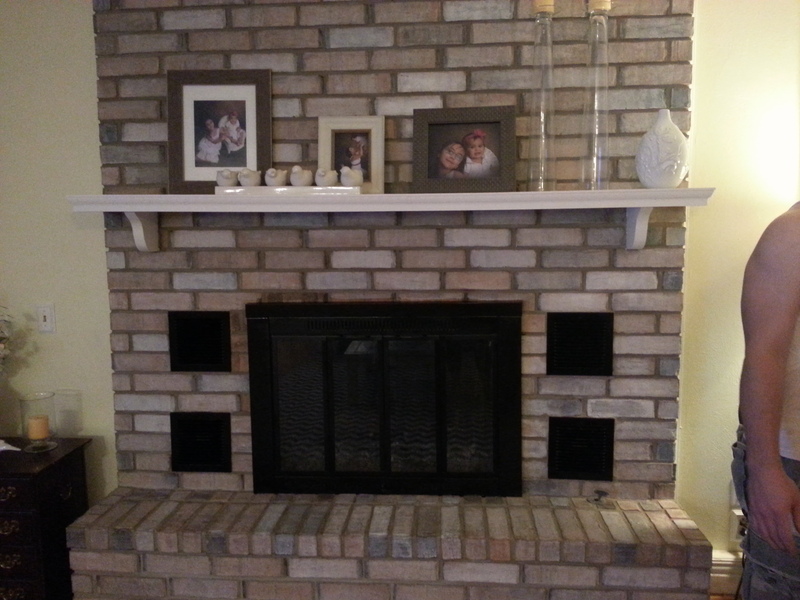 We loved that there was a fireplace and two big, bright windows, but there was a lot of design work to do. My first attempt at figuring this space out didn’t go so well. 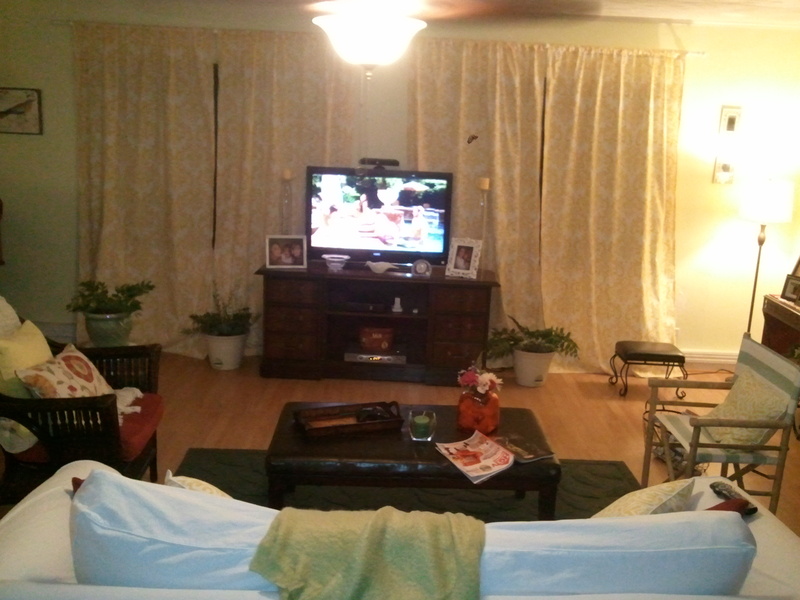 I painted the walls a light yellow and made curtains out of this gold damask fabric I got at fabric.com. None of our old furnishings fit the large space. 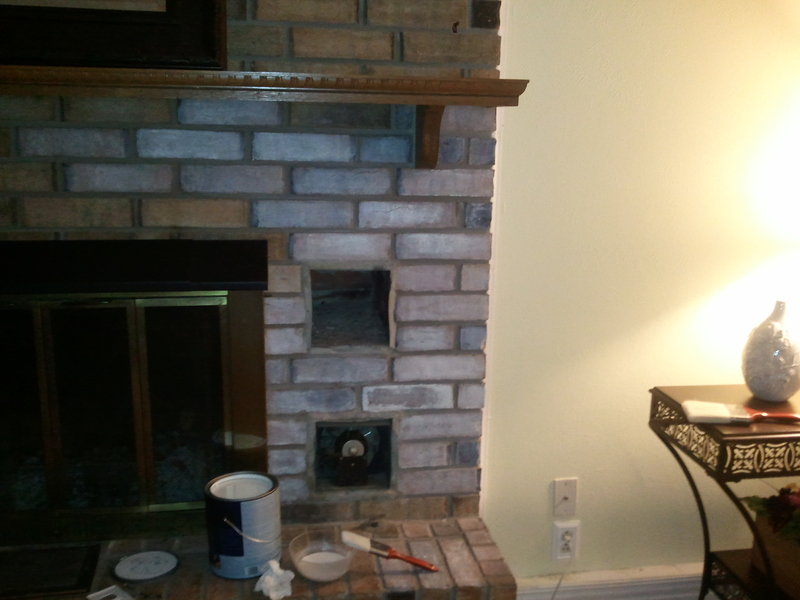 I ‘updated’ the fireplace by painting the mantle white and whitewashing the brick. Ok, back to the drawing board. First attempt clearly failed and I had to take the lock off my wallet to get furniture and accents that actually fit the space. 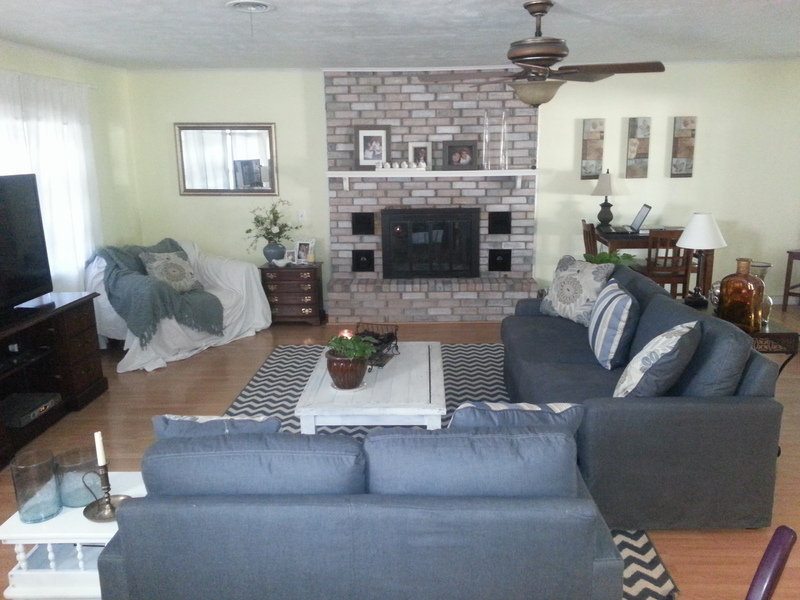 I changed the curtains to a solid white, bought new couches and bought a 8’11” chevron rug that actually covered some of the flooring. 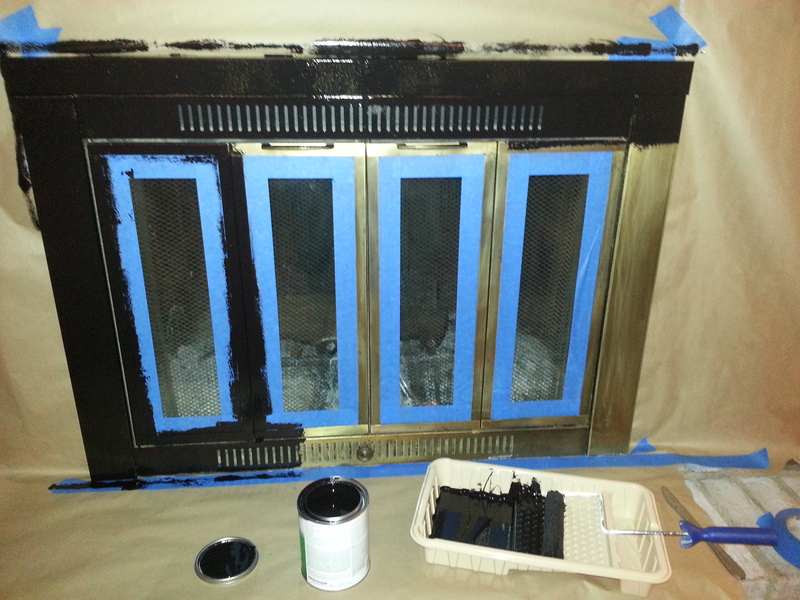 I gave the fireplace another update by painting the brass finishes black and I found a coffee table and TV stand through my thrift store treasure hunts. I liked it. It worked. And I kept it this way for a while. But, it just wasn’t right. I never walked in there and thought, man I love this space. It was pretty and all the pieces worked well together, but it just. wasn’t. right. Alright, round 3. I had to tackle the floor. Neither my husband nor I like the honey oak color. We dealt with it because we are both cheap skates at heart, but we hated it. Not only was it ugly and cheap, but it was poorly installed. 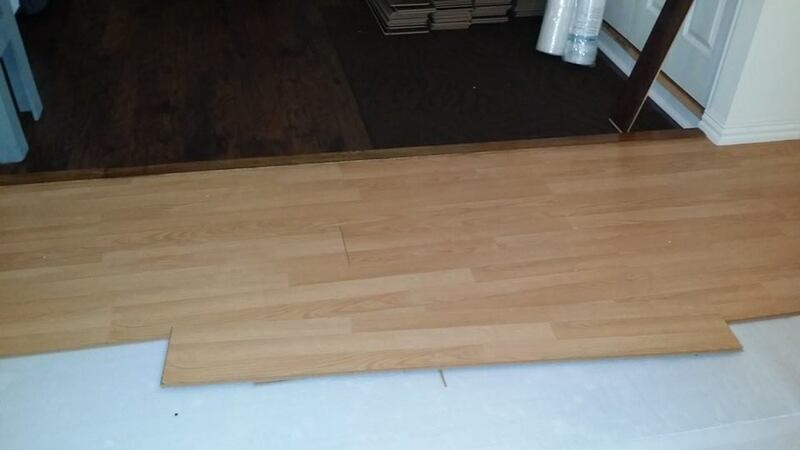 There were constantly huge gaps between the laminate planks. It drove us nuts. So we decided to look into new flooring and to our surprise it wasn’t so bad. 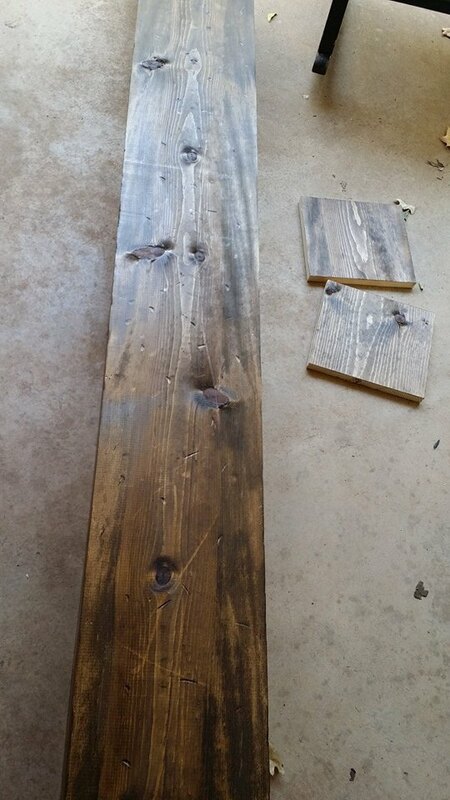 We were able to find a great look for a really decent price at Home Depot. We were actually able to put new flooring from the living room all the way through to the hallway. 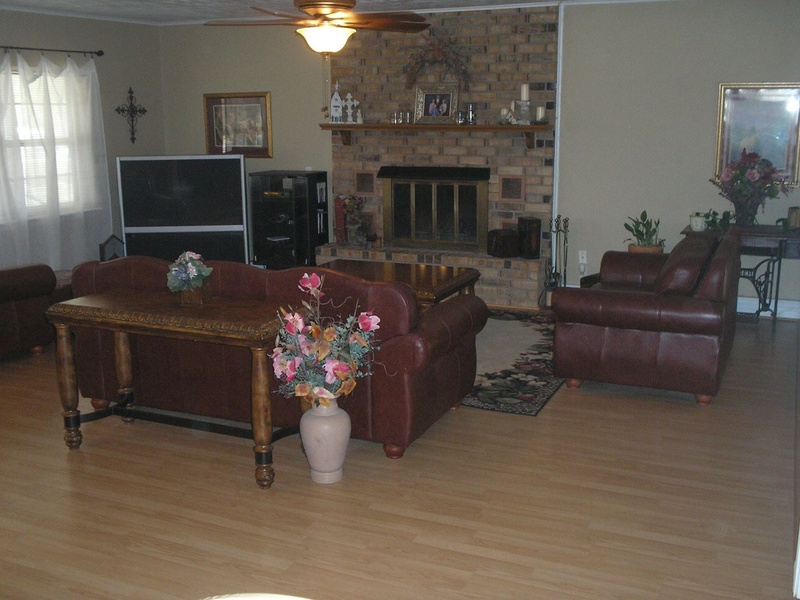 Installing laminate flooring is not a difficult job. If you’re on the fence about it, do it! I actually managed to do half of the job by myself, with 2 kids, while my husband was at work. For the area by the back door I wanted something a little hardier that would be able to stand up to the wet months and dirty shoes and not need to be cleaned constantly. 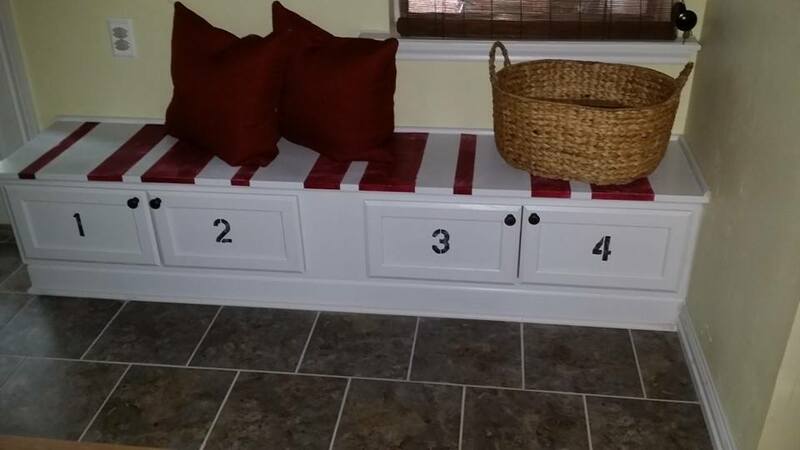 We decided to use some left over tile from our kitchen renovation and we also built a storage bench for all the shoes that pile up by our door. 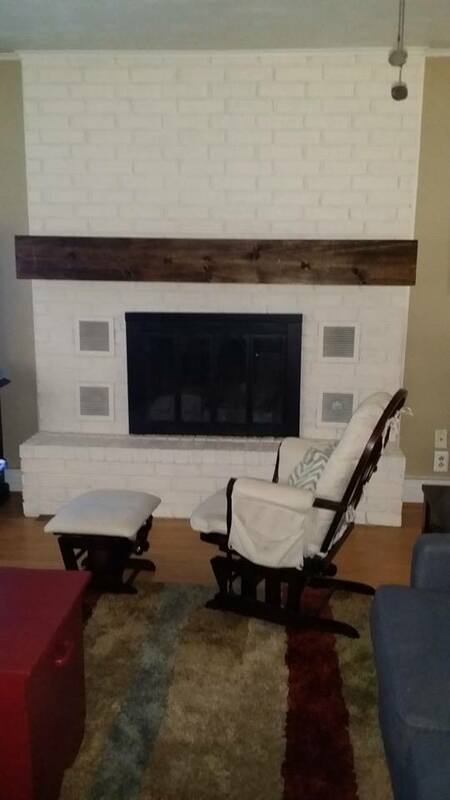 I built a new, rustic mantle for the fireplace and painted it white. 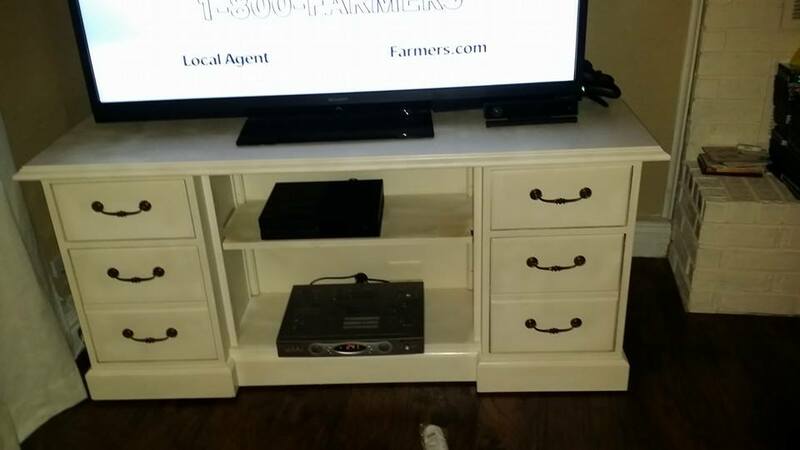 The TV stand got a makeover as well. 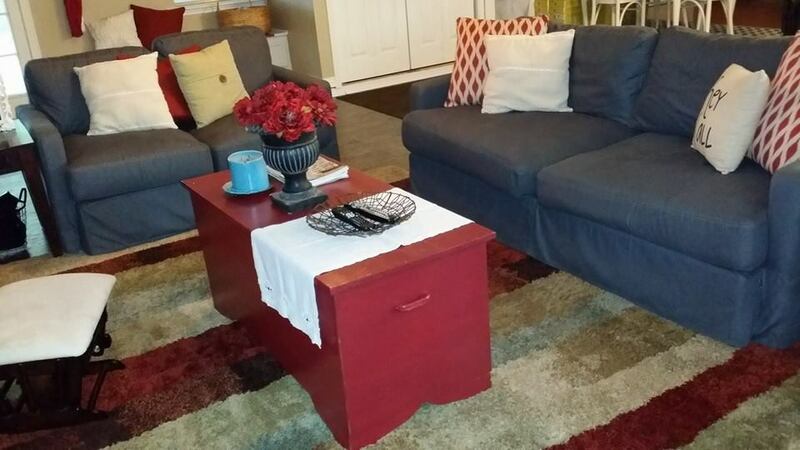 I found a large wooden trunk at a thrift store and gave it a coat of rich red paint and exchanged our old coffee table for that. I also got another new rug that had more warmth to it. 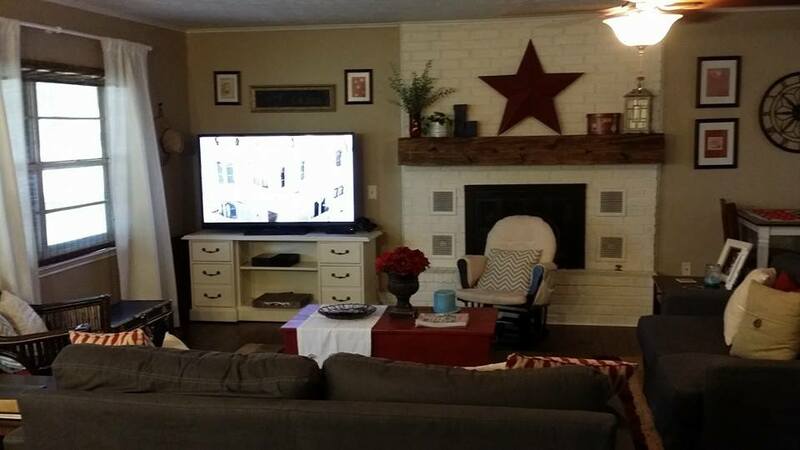 I gave the walls a neutral coat of beige, added a couple new throw pillows and some wall art and I was done! Ok, so this time I knew I was on the right path. 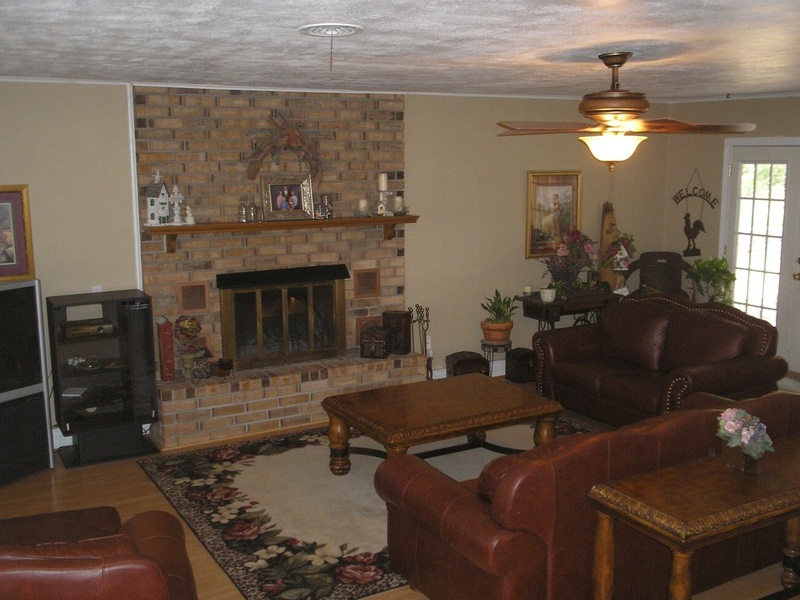 I really liked the warm, country feel the rug gave and all the red details. But something still. wasn’t. right. I decided I needed help. A sweet friend of mine had recently added me to a military affiliated design Facebook group called White Walls. You can share your designs, creations, rooms and get advice on anything design related. 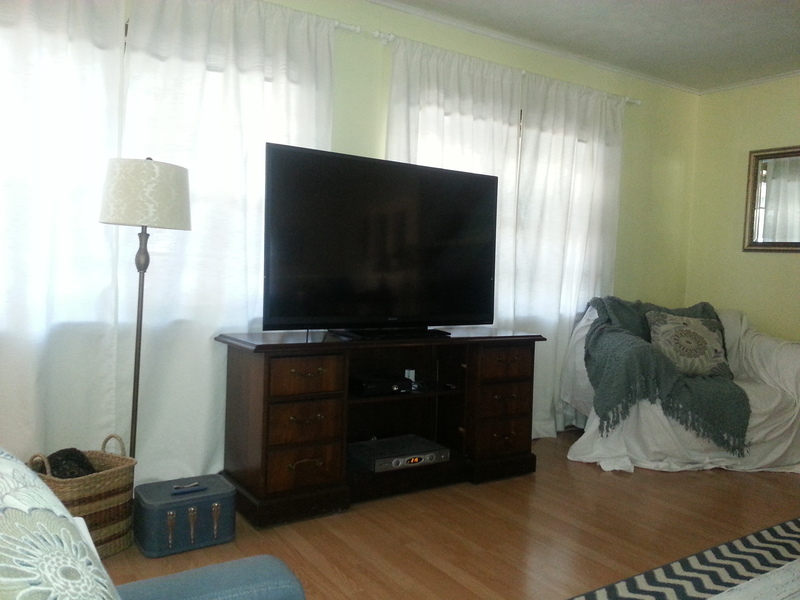 I posted pictures of my living room and asked for real, honest feedback. Most people liked the way it looked, but there were a few comments about how dark the room looked. THAT WAS IT! 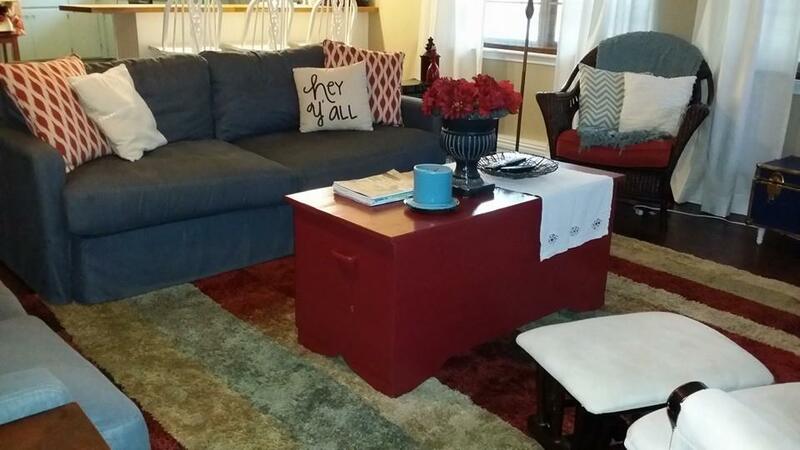 As much as I loved the red trunk and new rug and all the red accents, it was just too much. 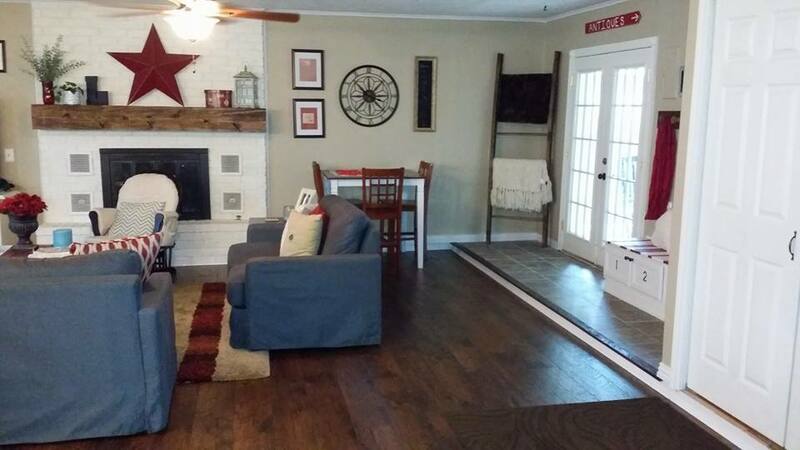 The dark floors needed more white accents and there was just too much wall art. 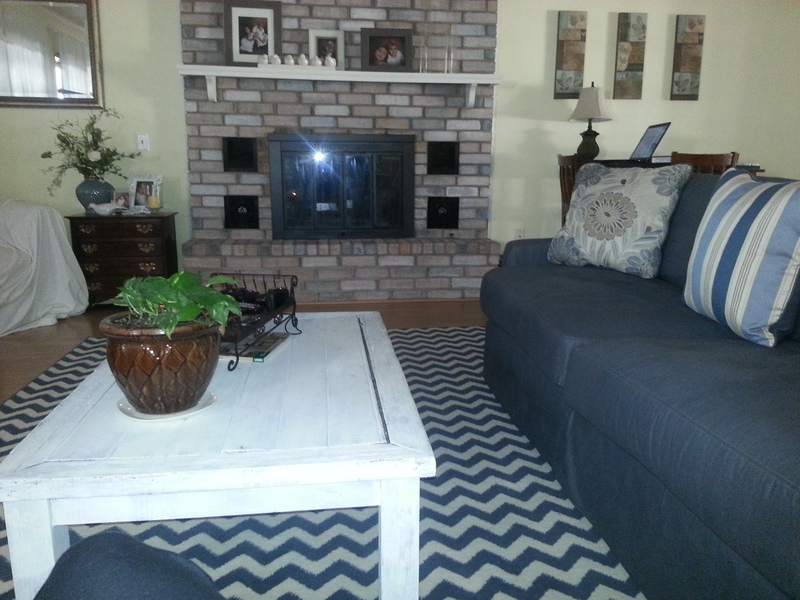 I took everything off the walls, brought the old blue and white chevron rug back and moved the red trunk out. I went from 10 pieces on the walls to only 2. Two! My husband built me a new table top so I used the old top to make sign and used it to fill up the large empty space to the right of the fireplace. It was meant to be! I painted a few more pieces white (blanket ladder, clock and floor lamp) and moved some of the darker pieces out. 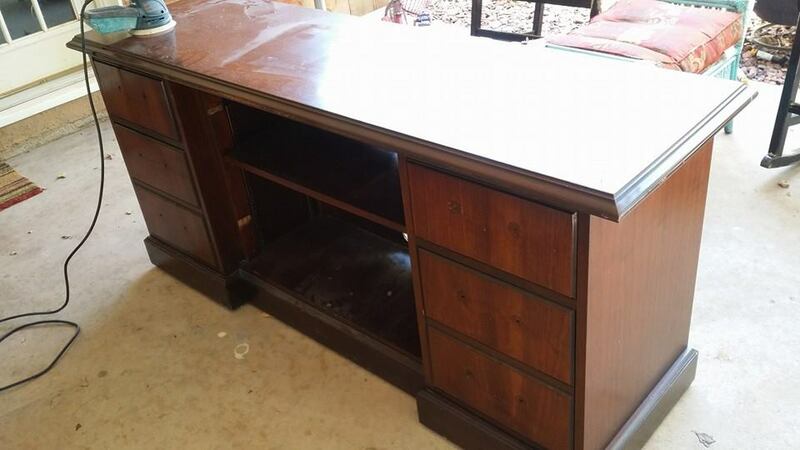 The large bar height table was replaced with a small desk for our computer and I got rid of an end table. Now, finally, a tour of our finished living room. It may have took me a while, but it was worth the wait.